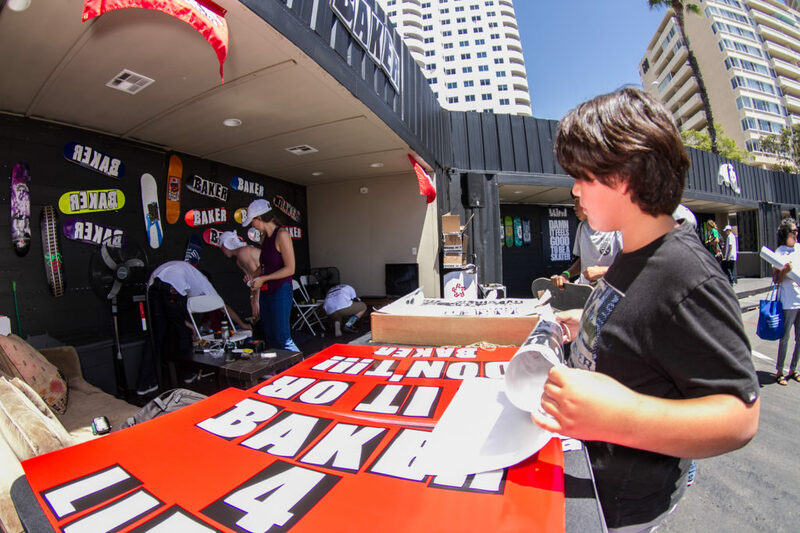 Virtual reality painting, an indoor drone obstacle course, helicopter simulators, excellent eats and the four skate courses open to local skaters, Community Day at Dew Tour showed the Long Beach locals exactly what it means to give back by having fun. Dew Tour Long Beach is a free event open to the public, but more than that it is an opportunity for new and exciting experiences between watching the world's best professional skateboarders. Friday marked the first day the Dew Tour was officially open to the public. In an effort welcome in the Long Beach residents, the day was dubbed Community Day and allowed for local skateboarders to hit the courses built for the professionals. 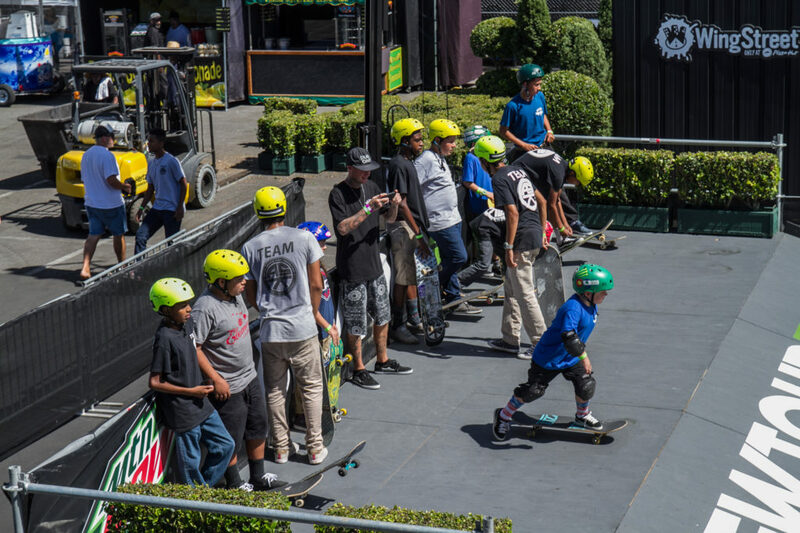 By partnering up with Action Sports Kids (ASK) Foundation and Tha Hood Games, Dew Tour hosted more than 50 young skaters from the area to set the tone for the day's start. Keith Williams, better known as K-Dub, is the founder and creative director of Tha Hood Games and explained the event as a day filled with kids getting the opportunity to skate on top-notch pro platforms. A skateboarder himself, when asked if he had a chance to roll around he said, "No, I let the kids do that. I can do more for skateboarding right now by not skateboarding." Once the local kids had their fill the pros took to the courses for their third day of practice, while the public was invited to watch as well as explore the Dew Tour Experience for some fun interactions with the brands and skaters. 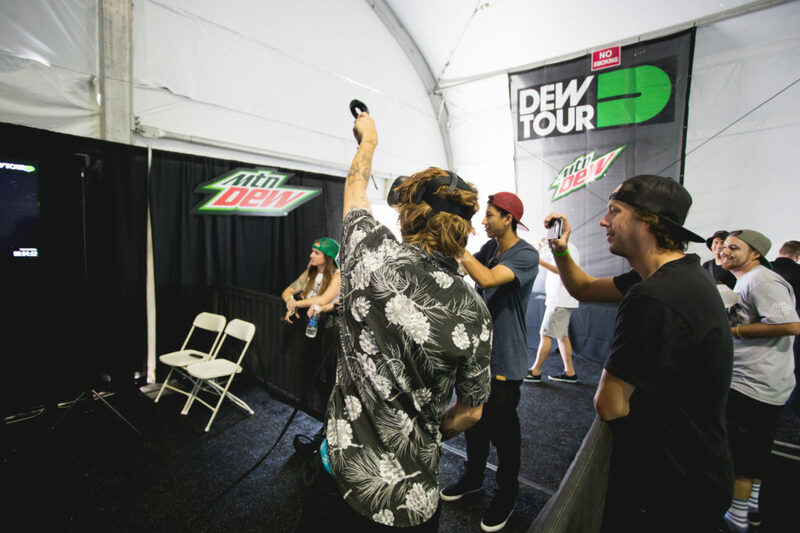 Mountain Dew built a Technology Experience inside a large, temperature controlled tent. Inside the tent two cutting edge activities were available to the public; virtual reality painting and a drone obstacle course. Intriguing to all, pro skaters and fans alike were found getting their virtual painting on and everyone seemed impressed. By placing goggles (similar to what you wear snowboarding) on and holding two joysticks you were immersed in a virtual world. One joystick functioned as your tool pallet while the other operated your paintbrush. Simply put, once you picked your canvas you were left to let your imagination run wild in your new world while your friends watched your actions on a nearby television. Opposite of the Mountain Dew tent was the U.S. ARMY activation that included a push-up station to earn t-shirts, a create-your-own dog tag station and even a couple of helicopter simulators to allow everyone the opportunity to buckle in and takeoff for the helicopter ride of a lifetime. Additionally, the Dew Tour Experience area hosted other event sponsor booths, tent activation spaces for endemic skate companies, tasty food trucks from around the area as well as Team Garages where athletes had an extra spot to kick it with their teammates while interacting with the public. One skateboard brand that had the locals hyped was Baker. Based out of North Hollywood, the Baker team made the short trek to the Long Beach Convention Center to personalize their garage space and stoke out the fans around the experience. Looking forward to the Pro Competition and Team Challenge, the guys in the garage expressed their hype for the events to come. Baker's "professional babysitter" as he titles himself, Doughnut let it be known that the crew stoked on the courses and that they are expecting not only the skaters competing—Theotis Beasley, Cyril Jackson, Terry Kennedy and Tristan Funkhouser— but appearances from The Boss, Andrew Reynolds, and Bryan Herman throughout the weekend. "All the kids here are sick! We have lots of free product for them, lots of fun and games for them to do," said Doughnut with regard to the fans stopping by the booth. "CJ (Cyril Jackson) is hyped on the whole thing, he was killing it on the gaps. Tristan, I know he is hyped on the transition section. Terry loves the rails. Everybody is having a really good time. It's going to be really good to see [Cyril and Theotis] in the transition section (laughs). That is going to be the best part. The Dew Tour Experience will be open from 11 a.m. to 6 p.m. on Saturday and from 11 a.m. to 5 p.m. on Sunday while the pros take to the courses for the competitions.